Last Saturday gave us the opportunity to join our good friends, the Zitzewitz Family, on their boat, Zray. 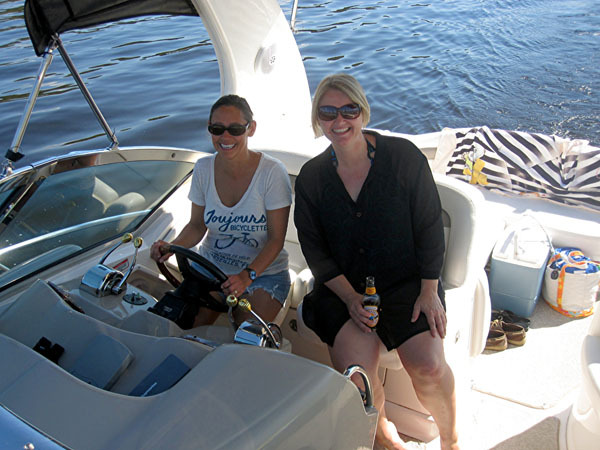 You see, the boat is a Sea Ray and their last name starts with Z. So the boat is called Z Ray. Get it? If not, please send me an email and I'll draw a diagram for you. The boys love being on the boat because it gives the chance to put on their Dancing Shoes and shuffle around the bow of the boat. Although after looking at the picture again, I see that they are all barefoot so I guess the dancing occurred without any shoes at all. But it still looked good. 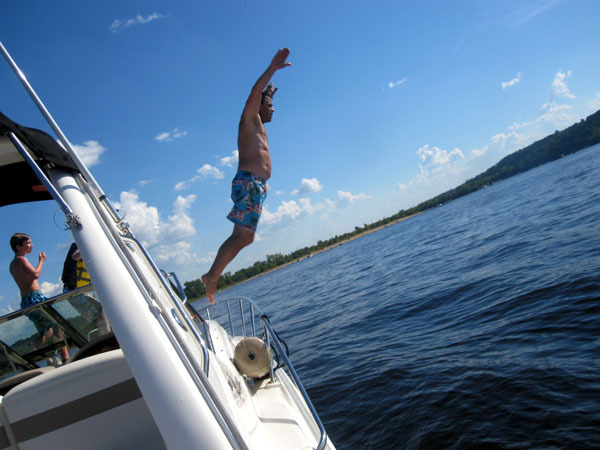 Karl always likes to impress us all by lifting his arms and suddenly flying off the boat into the sky. Every now and then he'll bump his head on an airplane, but other than that, it's very impressive. The future's so bright, they gotta wear shades. Either that or I was looking really bright while taking their picture. I don't remember which it was. Later in the evening, we made a stop in Stillwater, Minnesota at a restaurant. After a day of sun and swimming, the kids were excited for a break. The adults were excited to sit in a nice restaurant while wearing our swimsuits. It's so rare in life that we get to do that. 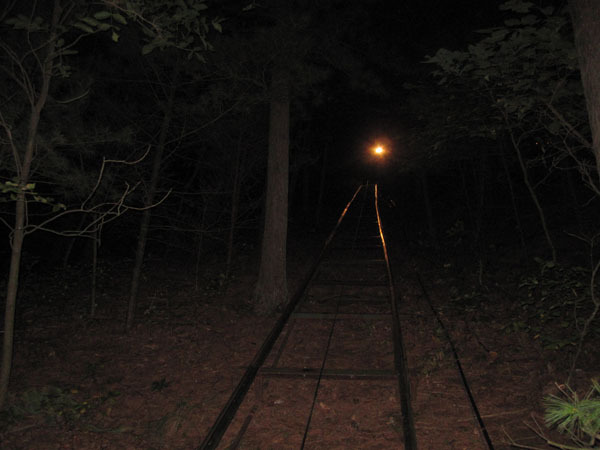 At about 11PM at night, they dropped us off at the dock and told us to ride the little cart up the long hill to our car. It was much scarier than any of us imagined it would be. Luckily, no beasts attacked us on our little journey to the top. Although I'm still kind of certain that I saw a ghost in the trees next to us. 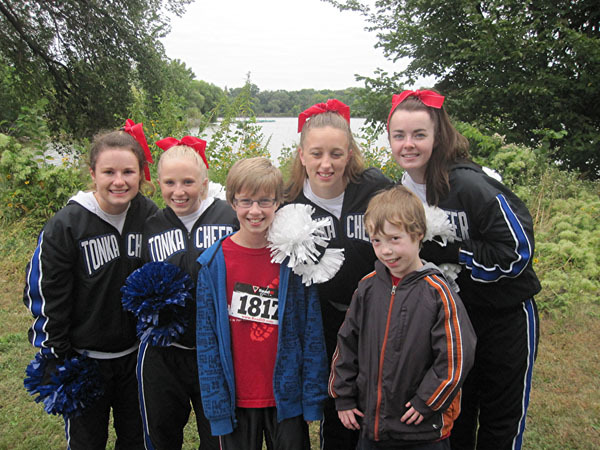 This Saturday, we went to Como Park to support Camp Odayin for their annual Heart and Sole Fund Raiser walk. 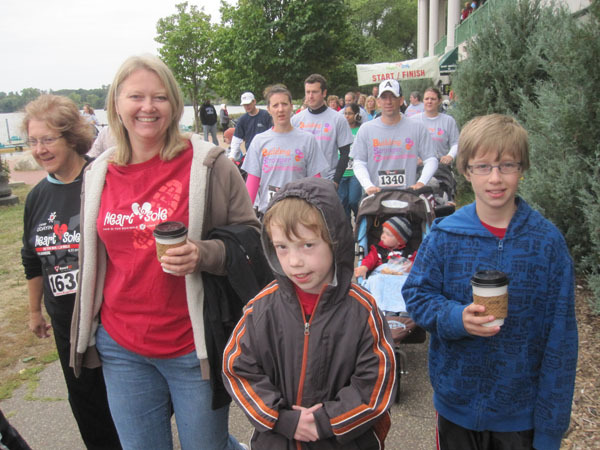 Some people run at the event, but that seemed like too much work for a Saturday morning so we just walked instead. It's a good thing the boys saved their energy because it turned out that a bunch of cheerleaders appeared right before the finish line. They were shouting for us to "Keep Going!" and "You're almost there!" 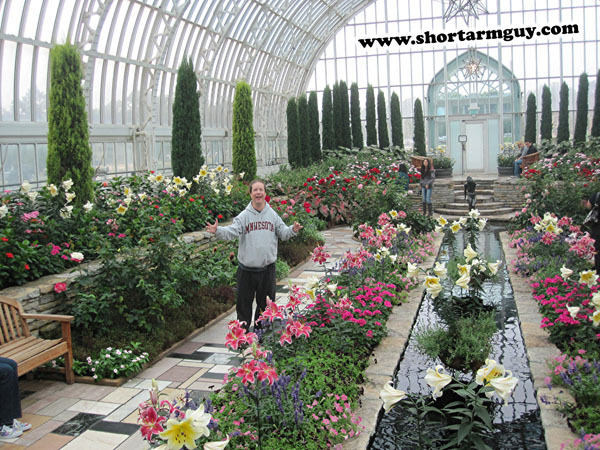 But we thought it would be much more fun to stop and get our picture taken with them. Even though it did add a couple minutes to our final time, the boys felt it was well worth it. 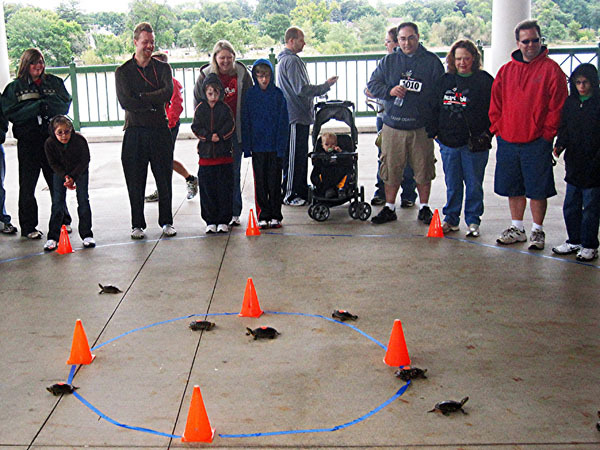 The event also had "Turtle Races" but we didn't like them at all because our turtle sucked. He didn't go nearly as fast as the other turtles. I have a strong suspicion that some of the other turtles had been juiced up with steroids or something, but unfortunately when I said something to the organizers about it, they just looked at me like I was a little dim. But it's that exact attitude that prevents this sport from being taken more seriously and for it to finally make it to prime time. But what do I know?